Primary production always bears the brunt of the cost price squeeze. In order to remain viable, primary producers need to continually improve efficiencies while meeting obligations from a legal perspective with new chain of responsibility laws. If you consign, pack, load or receive goods as part of your business, you could be held legally liable for breaches of the Heavy Vehicle National Law (HVNL) even though you have no direct role in driving or operating a heavy vehicle. In addition, corporate entities, directors, partners and managers are accountable for the actions of people under their control. This is the ‘chain of responsibility’ (COR). In your business enterprise, a Truckweighbridge gives operators a useful tool to ensure lawful obligations are meet. In all primary production businesses, inputs vs outputs at the farm gate need to be kept in check, be it meat, wool, grain, chemical or fertiliser. How these bulk products are managed has direct implications for your business’s bottom line. Calibration is king for grain producers. At seeding time, it is important to know how much is left in the 5 in 1 bin. While spreading fertiliser, it’s important to calibrate the machine to ensure application rates are correct. Yield monitor’s accuracy at harvest time is important as is keeping or cleaning seed to know what’s in the truck or silos. Feed weights for livestock farmers is critical when establishing rations and when receiving a truck load of grain or hay from a neighbour, it’s handy to know the exact weight rather than to guess. Being able to weigh trucks at the farm gate will eliminate the guess work and will easily assist with your overall mass management. Likewise for Transport business’s it is imperative to know the weight of your load on your axle groups in conjunction with your overall weight so that you can invoice customers with the knowledge of your exact load while meeting your legal requirements with COR. 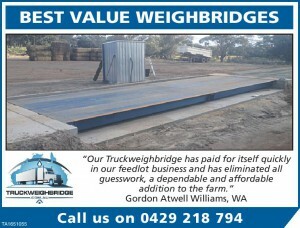 Truckweighbr idge is based in country WA and established with a strong focus to supply affordable weighbridge systems to match the needs of the agriculture industry for both primary producers and business’s servicing them, including transport companies. Our weighbridges range from 5m-40m in single or multiple decks and can be trade approved. They are of robust modular construction with precision accuracy and can be self-installed above or below the ground. The modular construction allows for easy transport, while making them mobile with the option to be moved between sites. Call us to discuss your weighing requirements and we will welcome your enquiry and work with you to match an affordable solution to your weighing needs.